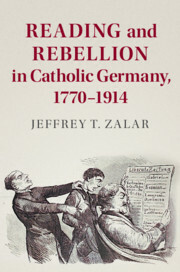 Review of Jeffrey T. Zalar, Reading and Rebellion in Catholic Germany, 1770-1914 (Cambridge: Cambridge University Press and the German Historical Institute, 2019). In 1984, when David Blackbourn and Geoff Eley published The Peculiarities of German History: Bourgeois Society and Politics in Nineteenth-Century Germany (Oxford, 1984), a revised version of their 1980 work in the German language, they challenged the prevailing historiography, much of which had embraced the Sonderweg thesis. For Blackbourn and Eley, the German bourgeoisie did not experience any abnormalities of growth and development in the nineteenth century, which set them apart from their European counterparts and enabled Germany to pursue a unique path of national development that ended in war and destruction. As we might imagine, much debate ensued. In Reading and Rebellion in Catholic Germany, Jeffrey Zalar likewise boldly challenges the existing historiography concerning the German Catholic milieu and its culture of reading, a topic that perhaps is less central to historians of modern Germany, but still important, nevertheless. For those who study religious history, especially that of the Catholic Church in Germany, Zalar’s findings have major implications for understanding the inner-workings of the Catholic milieu. For years, historians have portrayed the milieu as “an insular subculture, whose boundaries were policed by an authoritarian clergy” (8). He acknowledges that some historians, such as Rebecca Ayako Bennette, have begun to view the milieu’s boundaries more fluidly. Nevertheless, Zalar argues that “the core of the milieu idea, however, the narrative at its most tenacious, remains unchallenged” (8). For Zalar, an all-pervasive milieu theory simply cannot be supported by the existing body of evidence. He continues, the body of evidence is “too small, at least to justify the kinds of claims that are routinely made about lay submission to reading disciplines, which have never been demonstrated with documentary or archival evidence” (11). Zalar advises that he has critically followed John Connelly’s warning not to pluck “‘either disturbing or exonerating phrases out of the church’s murky past’ to satisfy the demands of a thesis when these phrases, if taken in isolation from one other, ‘tell us nothing about how people lived in a past that exists beyond our mental horizons’” (16; quoting From Enemy to Brother: The Revolution in Catholic Teaching on the Jews, 1933-1965, Cambridge, MA: Harvard, 2012, 10). Instead, Zalar sets out to discern the reading of Catholics from all economic classes, especially uncovering the reading habits of the “intellectually invisible people” of the lower classes by using the “widest possible methodological breath” (12). His evidence, rich and broad in scope, includes state and diocesan church archives, contemporary publications, and numerous parish archives (often neglected by historians), which uncover seemingly lost correspondence, library questionnaires, borrowing statistics of parish libraries, and other forgotten documents. Geographically, Zalar’s study covers the Rhineland and Westphalia, Prussia’s two western province’s that it incorporated formerly at the Congress of Vienna (1815). For Zalar, these provinces “along with Bavaria and parts of Silesia” constitute the “‘core regions’ of German Catholicism,” with the “highest degree of clerical authority and established thickest network of lay associations” (14). Further into his study, Zalar reveals a second motivation for his study. He writes, “Accordingly, in the 1970s and 1980s, empiricist social and cultural historians seized the field from the Kirchenhistoriker [Church Historians]. But their antipathy to theology was so complete that they disqualified not only its prescriptive encroachments but its descriptive components as well” (57). Like my own research efforts, Zalar redeems the impact of theology and a religious worldview as a causal agent in history. In this, he is quite successful. Zalar divides his study into eight chapters. He begins by describing the foundation of reading culture in Prussia, which consisted of a contrasting, confessionally marked outlook on reading. The Protestant bourgeoisie defined their reading habits with the terms Geschmack (fine taste and enlightened) and Bildung (education and culture). Reading was a means to educate and refine oneself both to advance in society and to advance society. Protestant reading culture was richly complex. There were terms for those who read too much, read indiscriminately, or read too superficially. Protestant readers who embraced such an outlook looked upon individuals who did not share their perspective as Geschmacklos, exhibiting bad taste. Central in this grouping were Catholics, who Protestants, in general, viewed as “clerically dominated, undereducated, and impoverished” (39). Less clear for Zalar is the place of the Catholic bourgeoisie in society and their relationship with Catholics of the lower classes. Such economic issues are not of central concern to the study. Rather, Zalar explains that there are historical reasons for the limitations that Catholics faced in Prussian society, most notably the 1803 secularization that closed eighteen Catholic universities, confiscated monastic libraries, and eventually placed three million German Catholics under Protestant rulers. Geographic location also negatively affected Catholics who resided disproportionately in rural, agricultural areas, to which the government dedicated fewer educational resources, and who pursued trades that did not allow for significant advancement in bourgeois society. In his second chapter, Zalar examines the Catholic alternative to the dominant Protestant bourgeois reading culture. He acknowledges that it is partially true that, unlike Protestants, Catholics did not experience a reading revolution at the beginning of the nineteenth century, and cites numerous reasons for this. Catholicism was reticent to promote lay literacy, in part, due to concerns that it might spread Protestant theology through written works. The baroque piety of German Catholicism was “overwhelmingly nonverbal,” encompassing pilgrimages, processions, memorized prayers, and illustrated catechisms (58). More importantly, are the goals of Catholic reading, tied directly to theological concerns. Zalar explains, “Salvation…did not depend upon acquiring right knowledge but upon the practice of virtue in a holy lifestyle that united one to the merits of Christ’s sacrifice on the cross and resurrection” (66). Reading then had a spiritual function quite different in nature to Geschmack and Bildung. Its aim was to assist Catholics in their efforts to follow Christ and so achieve eternal salvation. Zalar develops these notions in more detail in Chapter Three (117-119). There he explains that reading imparted an experience of delectatio (delectation), which Zalar defines as “the deliberate accommodation of oneself to these gifts [transcendentals gifted by God] in obedience to God’s will through bracing encounters with good, beautiful, and true objects” (118). Yet, reading could no longer be limited or controlled once it was done in the privacy of one’s home, even when spiritual growth and clerical oversight was emphasized. As a result, personal interpretation and discernment became a part of the reading experience. Although clerics attempted to control and mediate this experience, even in this early period there is evidence of Catholics and Protestants sharing books. Chapter three concerns Catholic reading habits following the Congress of Vienna and under Prussian rule. While article sixteen of the Federal Constitution guaranteed civil rights for all subjects, Catholics did not receive equal treatment. Rather, Protestants who held most government administrative positions looked down on Catholics as uncultured savages who had to be managed and controlled. A dominant view was that Catholics were incapable of contributing to the Kulturnation (cultural nation). Some public discussions even insinuated that Catholics were “obstacles to economic growth” and politically unreliable (105). Educational deterrents promoted such outlooks and kept Catholics from advancing in society. Gradually, there were changes as more Catholics took advantage of education, but it was a gradual and arduous process. German Catholics did resist such stereotypes and restrictions through their press and journals, portraying Protestants as undermining morality and poisoning society. Amid this confessional antagonism, Catholics broadened the titles they read. Ironically, rectory libraries often contained books purchased by priests that fell outside the confines of spiritual or approved reading. Catholic book clubs also developed that focused upon texts approved by local clergy but also upon religious fiction. Though these clubs often were led or involved clergy, Zalar argues they “ultimately subverted unity” by allowing discussion and consideration of ideas and texts gained from outside sources, thus allowing numerous influences on the formation of Catholic consciences. In the first part of the Nineteenth Century, the Catholic bourgeoisie rejected clerical oversight and moved closer to their Protestant contemporaries, embracing the concept of Geschmack even more. At the same time, reading increased substantially. Zalar notes that students reading in the evening often “spent more on candles than they did on books or coal for heating” (128). Chapter four focuses on the 1845 foundation of the Association of Saint Charles Borromeo, the Borromäusverein, under the initial leadership of August Reichensperger, a Cologne lawyer, and Max Freiherr von Loë, a Landrat in Siegburg. The namesake was apropos as Borromeo had been a catechist and staunch supporter of the Counter-Reformation. Though the society had many lofty goals upon its establishment, it eventually became a book club with local chapters relegated to promoting and distributing lists of spiritual reading. Its founders and clerical supporters hoped the Association would counter the effects of Catholic lay exposure to Protestant Enlightenment ideals and values. Though meant for all classes, the bourgeoisie generally did not become members as the Association’s goals seemed to oppose their own. Zalar argues that under the Borromäusverein, “never before had or never again did the German church come so close to realizing the Catholic readerly ideal” (155). Yet, in 1870, the Association had only 54,000 members or 1.5 percent of the Catholics living in Westphalia and the Rhineland. Still, the ideals of the Boromäusverein reflected the great chasm that existed between the reading cultures and outlook of German Prussian Protestantism and German Catholicism, especially on the eve of the Kulturkampf. In line with Zalar’s challenge of traditional historiography, he also rejects the notion of Catholics becoming ghettoized during the Kuturkampf, viewing such a concept as “too simplistic, as well as misleading.” Rather, he describes Catholics as tending to “huddle behind an edgy defensiveness” (157). Along with many Catholic institutions, the Borromäusverein was not spared losses and membership because of state persecution. Lay reading discipline also weakened during this period, a point that Zalar emphasizes by countering previous interpretations with documents recording the increase of the volume of reading and clerical denunciation of such activity (171-172). As Zalar argues, the “milieu may very well have been clericalized,” but citing, for example, a priest scolding a parishioner, it is “hardly evidence of lay submission to it” (173). At the same time, Zalar relates that the entire act of censorship had become extremely unpopular with society. Censors, he argues, had earned a reputation as “ignorant, misinformed, fumbling, zealous extremists who mindlessly applied and more often misapplied feckless rules they themselves did not always understand” (178). Chapter five examines the transformation of Catholicism under Imperial Germany in the context of Catholic reading culture. Industrialization and urbanization rapidly altered the landscape of German society. Nevertheless, the centuries-old animosities between Catholics and Protestants remained. Such tensions and limitations in a Protestant-dominated society forced German Catholics to become more introspective. Zalar argues that Catholics “did begin to trace their peripheral existence to the attitudes and disciplines of their church” (194). After the 1890s, when more educational opportunities opened for Catholics, they could no longer blame the government for discriminatory policies. Even the German bishops realized their denomination’s plight and, in 1896, assembled in Dortmund to discuss the situation. The result of this discussion, both among clergy and laity, was a greater openness among Catholics to modernization and education. The German Catholic Church founded new associations to promote Catholic scholarship, education, and engagement with secular culture. Eventually, the number of Catholics attending university increased. Such advances not only impacted the upper classes but also the lower classes as new professions opened to them. Some priests, too, participated in promoting new vocational and employment opportunities. Even the Prussian Ministry of Culture and Public Instruction, in 1876, instructed public libraries to become confessionally neutral. Chapter six documents the fall of the Borromäusverein, locating it even before the beginning of the Kulturkampf. Zalar points out that this did not mean that Catholics had foregone religious books. The texts that had merit were already sacralized in their homes, available to read at moments of crisis and for spiritual discernment. As educational opportunities and the desire for the consumption of knowledge increased, the Association simply did not meet the needs of German Catholics who desired to read more broadly. The craving for advancement led Catholics from all classes to open their minds and hearts to the notion of Geschmack, reading now for personal and societal advancement. Similarly, the introduction of electric lighting, mass entertainment, and the like, expanded Catholics’ experience of the world. By 1897, the executive committee of the Borromäusverein knew that it had to find a different path to pursue to keep their organization relevant. The committee members drew up new statutes and then hired Father Hermann Herz, a Swabian priest, author, and editor, to implement them. Conservatively Catholic to his core, Herz also realized that he had to engage modern culture to capture the attention of Catholic readers. Though Herz was not afraid to stand up for his faith, he also sought to avoid antagonizing Protestants. To this end, none of the publications of the Borromäusverein mentioned the May 1910 encyclical of Pope Pius X, which “condemned the Protestant Reformation as “an enemy of the cross of Christ’” (263). If anything was to be condemned, it was “dirty and trashy literature,” which the Association endeavored to root out (263). The final two chapters examine the impact of the reconstitution of the Borromäusverein within the context of the changing reading habits of the Catholics of western Germany. Though great advances were made in expanding the libraries to include largely non-religious collections, the Verein still only engaged a minority of the Catholic population. Those who were members came from all classes, though the lower middle class patronized the Verein’s libraries the most. Clerics gradually turned over their leadership and oversight roles to lay volunteers, especially to young Catholic women. Father Herz also encouraged chapters to move their libraries out of rectories to more neutral locations, in order to remove any lingering suspicion of clerical censorship. Despite such efforts, Zalar admits that “a chapter might change in orientation overnight with the arrival of a new priest” (289). Such contradictions are present throughout Zalar’s narrative; yet, to this reader, they are not problematic, but only reveal the realities of German Catholic society as changes gradually took place within the milieu. Modernity crept into the daily lives of German Catholics and as it took root, multi-layered unrest developed. Thus, on the eve of the First World War, Catholics were not far apart in their reading habits as their Protestant counterparts after having replaced the spiritually rewarding delectatio with Geschmack. Zalar concludes that now laity “controlled the word” and were the “new ‘rulers of men’” (363). With the scarcity of English language works on nineteenth-century German Catholic culture, Zalar’s study is truly welcomed. He has produced a brilliant sophisticated examination of the changing reading habits of Catholics over two centuries. Throughout his narrative, he successfully contextualizes his discussion of books and reading within the larger narrative of Catholic efforts to gain parity in the Protestant-dominated German society of that period. At times, I wanted to learn more about the internal class struggles of Catholics that took place within this narrative. Zalar does provide hints of this tension, especially between the bourgeoisie and lower classes, but I had hoped for more details. However, this in no way reflects negatively on the book’s overall argument. Zalar is persuasive and compelling in his objection to the dominant clerical milieu thesis, pointing out that, at least in their reading habits, German Catholics did not always follow the Church and its clergy’s clearly demarcated boundaries. At least for the nineteenth century, our understanding of the German Catholic milieu must be rethought and reexamined. Likewise, Zalar’s findings and reinterpretations are important to our interpretation of German Catholicism in the Weimar Republic and under National Socialism. It would be very interesting to learn how Zalar interprets the Catholic milieu during these periods, considering the existing historiography. With all this said, I highly recommend Zalar’s work.